It was another typical weekend at our house. Outside, the birds are chirping and lawnmowers are humming. Inside, one kid’s screaming and the other’s running in circles, bumping into the other one each time he passes her. Mommy’s making a much needed coffee in the kitchen while I navigate the landmine-like field of toys strewn across our floors towards her. “Good morning” she says, a smile about to creep across her face when all of a sudden her eyes go wide. “FFFF—udggggsicle!“, I blurt out, as I connect the reason for her expression with the stabbing pain in my foot. I look down to see that a plastic star shaped toy has forcefully mated with it. I hop around awkwardly as I continue to silently mouth words that no child under 25 should hear. Young children are mostly destroyers, happiest when they’re sitting in the centre of a makeshift ball pit of their own creation using all the toys you’ve just put away. When I’m finally able to speak again, I tell the kids to clean up their toys. I even throw in an “or else!” at the end. You can imagine how thrilled I was then, that after my command, I watched as my daughter continued screaming and my son kept on running. My words had no effect, maybe because my daughter’s perfectly pitched screaming was the best white noise machine ever. Or, more likely, because we’d never actually taught them to clean up and they thought Daddy was excitedly cheering them on. Deciding it was time to put my foot down–without the fear of stepping on tiny weapons of mass destruction–I turned to Google for help. 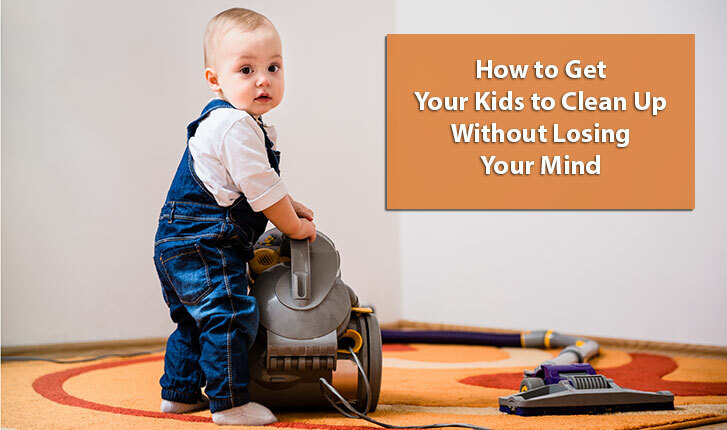 I typed “How to Get Your Kids to Clean Up Without Killing Them”, the end of which I quickly changed to “Without Losing Your Mind” as my wife walked over. A tap of the enter key and there were the tips and tricks I hoped to tattoo on my children’s foreheads–just kidding, of course. How often do you find your little ones copying something you’re doing? Ours do all the time, especially when we don’t want them to. Kids are usually more responsive to things we do rather than what we tell them. So if you’re always cleaning up junk and making sure there’s very little clutter in your home, your children will see this as normal, the standard by which they should also be living. Setting a good example should always be the first step in anything you teach your kids. Needless to say, the scale of “small” here will depend on how old your children are. As with anything we teach our kids, it’s always best to give positive feedback and to match the task to the child’s age. For a 2-year old, it could be as simple as putting a stuffed animal back in its place. For a 6-year old, it could be helping to clear the table and throwing garbage into the trash. The first step to take, regardless of age, is to let them watch you clean up. Talk them through the process as you do so. Next you can allow them to help you while you coach them and then eventually (we’re desperately waiting for this day), they’ll progress to tidying up on their own with minimal instructions from you. Anyone who connected with the story in the introduction is probably laughing at this tip. Young children are mostly destroyers, happiest when they’re sitting in the centre of a makeshift ball pit of their own creation using all the toys you’ve just put away. Older children, however, can be taught a couple of useful rules about their possessions to minimize clutter. Encourage the use of only one toy at a time and insist that they first put that one away before playing with another one. Extend this rule, if you can, to possessions. Have a limit to the number of toys or types of clothing that your child owns, and then enforce a “one in, one out” policy. A new toy is ok, provided that they give away an old one. This can double as a lesson in the good that comes from donating to those in need. Choosing to go down this route may mean a considerable amount of work with an initial purge of excess belongings, but the peace that comes from the lack of clutter will be worth it. Book a dumpster rental to make disposal easier if you have to. Have you ever seen those kid-sized Dirt Devil vacuum cleaners? They’re awesome. Watching kids use them makes even us want to vacuum! It’s pretty obvious that even though most children are fascinated by your monstrous vacuum cleaner, most lose interest and worse, even get frustrated because it’s too big and unwieldy. 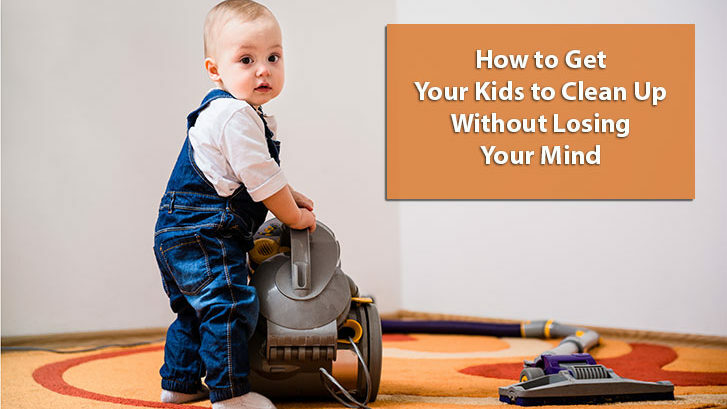 Find appropriate tools for your kids to help you clean with, considering both size as well as the amount of motor control a child will need to use it. It should also go without saying that anything your children are cleaning with must be free from chemicals and have no dangerous parts unsafe for curious little hands. Readers of our blog and specifically our article on beating back-to-school clutter should know we’re big fans of scheduling decluttering tasks. Make cleaning and decluttering a priority just like any other priority in your lives. Incorporate clean up into your kids’ daily routines, just as you have with other tasks like brushing their teeth. In our house, the rush to get out of the house weekday mornings usually results in a mess in our children’s rooms. If this is your family as well, create a 15 minute period after school or before bed where the kids can help clean up this mess, and stick to the time limit. Everyone, especially children, tend to tolerate undesirable tasks better when they know it’s only for a limited amount of time. If your children are too young to understand the concept of time, telling them that they’re going to get their favourite bedtime story or favourite snack next are great alternatives. Using a chart to track chore assignments and progress is a great way for everyone to stay up to date with their tasks. If your children are into stickers, you can create a chart that uses their favourites to mark completed chores for motivation. There are commercially available chore charts available today, but a quick search on the internet will yield plenty of ideas on how to make your own. If your children are too young to understand charts, stickers are still a great way to motivate most children. Giving them a sticker every time they complete a simple task is a simple way to positively reinforce their efforts. Empowering your children with their own choice is a great one that we’ve used with our own children for other goals. Not surprisingly, a child allowed to choose the chore he prefers out of a couple of choices is more likely to complete it than one who’s forced to complete the one you’ve assigned. If you’re just starting your journey into getting your kids to help clean up and declutter, we hope this information has been helpful and wish you the best of luck! We know we need it. And if you’re already on your way, let us know what’s worked for you in the comments below. If, on the other hand, your kids are doing all the cleaning in the house, please let us know how we can hire them! Follow us on Facebook or Twitter for more tips, news and updates.